Rocks, South-West Rocks, Loe Gate, Kingmere Ledges and Marina Reef; details can be found in Sublittoral Chalk Habitats of Southern England. The shore begins at the extreme high-water spring tide level above which is the ‘splash zone’ (shore zonation). This may be on the beach itself or up the cliff face. It extends down to the extreme low-water spring tide level (see tidal levels). 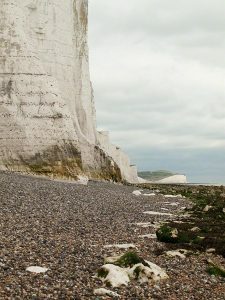 Shingle typically forms narrow beaches adjacent to the cliff, but these deposits can be absent – the exposed chalk extending straight down the beach to low water. Beaches reduce, ‘spend’, the energy of the on-shore waves, which can be fierce, so having them helps to protect the land. Consequently, people have tried to encourage sediment deposition, i.e. beach development, by building structures (groynes and breakwaters) at right angles to the shore. The predominant currents along the coast are from west to east and coupled with the prevailing SW winds carry sediments along in a process known as ‘long-shore drift’. Groynes and breakwaters interfere with the longshore drift and cause sediments to build-up on the westerly side of the obstruction as the swash pushes sediments up and along the shore thus increasing the size of the beach. 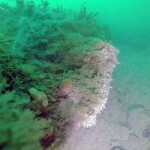 On the easterly, sheltered, side of a breakwater sediments become scoured out by the backwash. So, walking along the shore west to east the shingle may become level with the top of a groyne, stand on the groyne and there can be a drop of several metres to the next beach. A shingle-sandy beach is a complex living thing. 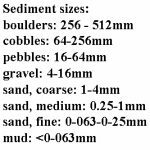 Not only is the sediment moving up and down the shore and to the east, it is also being sorted and graded, to a greater or lesser extent both up and down the shore but also through the depth of the deposits (dig down and see). Typically, coarse deposits of shingle occur furthest up the shore with finer ones of sand lower down. Similarly particles are sorted across the beach from west to east. 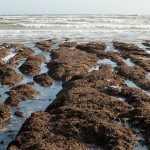 The deposits are not uniform, beaches are not flat, rather they are ridged with dips and peaks produced by different tides and the prevailing weather. The pattern of ridges changes throughout the year with a beach having a ‘summer’ and ‘winter’ profile. The highest ridge occurs at the level of the spring tide (tides …), this is followed by a dip or valley then another ridge, the mean-tidal ridge, then another dip followed by a third smaller ridge at the level of the neap tide limit. Powerful winter storms can produce huge extreme spring tidal deposits with many hundreds of thousands of tonnes of sand and shingle moving in one night. 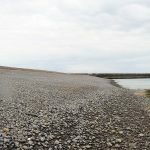 Seawalls help to reduce coastal erosion and protect low-lying areas, but nothing can stop the power of the sea – winter storms can produce waves that break high enough to overtop the cliffs and fling huge quantities of pebbles across adjacent roads! A real pounding, constant attack on the cliffs. Water draining from the land, frost and heat from the sun also contribute to cliff erosion. Cliff falls can be gradual, odd bits dropping off on to under-cliff walks, or catastrophic with tens of thousands of tonnes crashing down. 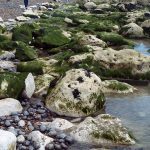 Along unmanaged stretches of the coast cliff beaches chalk boulders occur adding another dimension to the ecology of the shores. 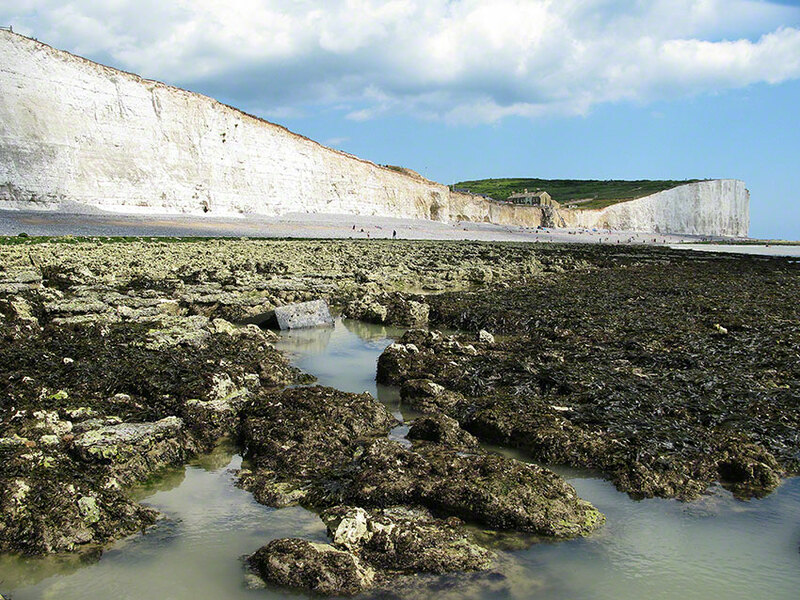 The upper-shore shingle with or without boulders extends for 0 to 30 metres where it may continue for a few metres as sand or go straight to the exposed chalk of the wave-cut platform (the ground-down extension of the chalk strata). 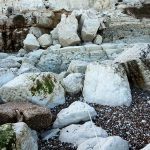 The first couple of metres of the chalk is white, rounded with lumps of knobbly flint or areas of tabular flint, lacking little life – it is too pounded by the waves and adjacent pebbles for anything to survive in this ‘ball-mill’. 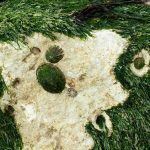 Some organisms can occur in sheltered areas and during the calmer summer months including diatoms, cyanobacteria chains, burrowing Polydora worms and even the odd limpet, periwinkle or anemone. Away from this marginal ‘ball-mill’ life can take advantage of the chalk. Nature abhors a vacuum so any exposed structure, be it chalk, flint, concrete, wood, or wreckage, will be colonised on, in and beneath. Only the action of the waves and grinding sediments will prevent it. 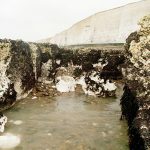 The soft nature of the chalk and its structure means that it is eroded forming the platform that becomes dissected by gullies running at right angles to the shore. Cracks, weaknesses, fissures etc become scouring deeper by the back and forth motion of the waves and tides dragging pebbles and sand. The depth, width and morphology of these gullies varies along the coast and can range from being shallow, just a few centimetres deep and smooth (the wave-cut platform being almost flat), to being deep, 200 cm and rugged. These variations are a result of the curvatures and aspect of the shoreline with some beaches very exposed to the SW gales and storms more than others. Exposed ones, like those to the west of Newhaven Fort, form flat expanses with little algal growth except for stunted coral weed, Corallina officinalis. Sheltered ones have rich algal cover and deep gullies. Gullies can run straight down the shore or are interconnected and form a network. 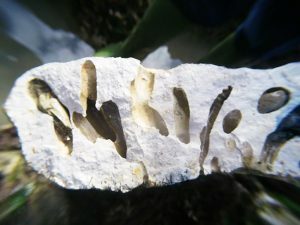 Gullies have sand/gravel/pebbles/cobbles at their base and are continually scoured exposing the white chalk and preventing colonisation while the sides above the scour are colonised by algae and animal turf. Scouring and erosion can result in the gullies forming simple V or U-shaped ‘valleys’ or more vase-shaped in section with a narrow top and deeper base. Walking over the deeper gullies is potentially dangerous and is not helped by the more-or-less extensive covering of algae which can obscure gaps and provide trip hazards at the least or pit-fall traps at the worst. Small to quit large rock pools also form on the platform. The smaller ones evolve from depressions, from perhaps a lost lump of flint, filling with water and pebbles that effectively form rock-mills: water action swilling the pebbles around grind-out the pool. Larger ones’ form from dips and hollows in the chalk. Home range grazed by Common Limpets, Patella vulgata, on chalk surrounded by Ulva linza, upper shore. With this complex of surfaces a rich variety of niches are available for life including the relatively flat tops and sides of gullies, expanses of flat chalk, flint tables and nodules, crevices, small caves, overhangs, holes, and deposits of sediment etc.